Elizabeth’s Lollypop Trees Hit Print! | OccasionalPiece--Quilt! Elizabeth’s Lollypop Trees Hit Print! 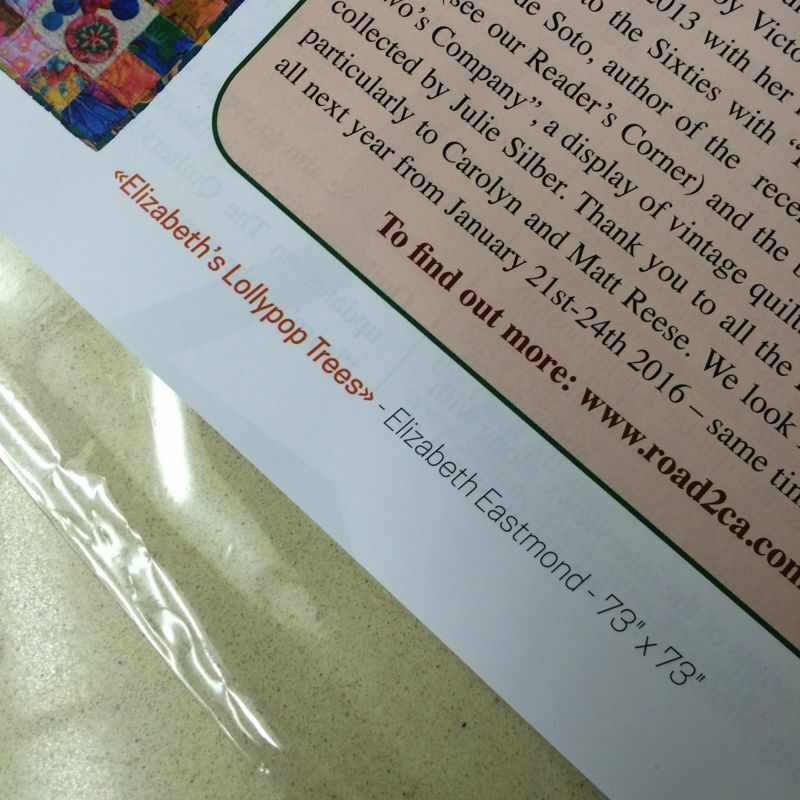 Posted on June 3, 2015 by Elizabeth E.
The Lollies hit print! Diane, a reader of this blog, recently sent me a note telling me that my quilt was in QuiltMania’s May-June issue. I thought it might be a pitch for Kim McLean’s fine pattern, so at first I didn’t think it was mine. She wrote back: “It’s yours!” and then she sent me photos to prove it. Bless you, Diane, for letting me know (as I received no notice from the magazine). It was a part of a spread for Road to California this past year, and I was thrilled to be included in this article. I ordered a copy from Fat Quarter Shop and it arrived via post today. What a lovely surprise! How exciting! And it looks like it is a large photo–taking up more than one page. A job well done. Big time congrats! A great quilt magazine to appear in! Congratulations! It is so unique and gorgeous! Its wonderful to see your quilt shown off so beautifully! But seriously, they did all that without asking you??? Congratulations! What a wonderful surprise! Looks like they did a beautiful job of showing it off. Will have to look for the magazine and see it for myself. Wow! What a nice big photo! This is one of my favorites of your quilts, and I’m so glad it (and you) got some well-deserved attention! Isn’t this the best!!! Congratulations on this accolade Elizabeth! A fabulous (almost) double page spread in one of the best quilt magazines in the world! What an achievement! We get this magazine here, so I am now on the lookout to buy a copy of it for myself!!! Congratulations!!!! Such a wonderful surprise for you!!! The Lollipop Quilt is one on my Quilting Bucket List!!!! That is awesome!!! Congratulations. It is well deserved. Congratulations on the magazine article ! I’ve spent quite a bit of time reading around your site. I’m in awe – beautiful, work so many generous tutorials and such gorgeous english paper piecing blocks. I haven’t done any of that sort of hand work – I don’t know if I could because I have carpal tunnel but I would like to give it a try. Thank – you. How exciting, Elizabeth! And, it’s very well deserved…that quilt is just stunning. Your talent is being seen around the world Elizabeth! Congratulations! I’m so so happy for you Elizabeth! It’s an amazing quilt and truly deserves to be documented in such an incredible magazine! Congratulations on the published quilt. Such appreciation is well deserved in your case! So gorgeous!! Well deserved to be sure. The quilt is so fabulous! Yum. Yum. Congrats. International, no less. Don’t suppose this one is in a USPS box, either. Still drooling. While I’m most assuredly glad for you to have been recognized in this prestigious magazine, I still feel this attention wasn’t properly rewarded. It seems apparent that the Road folks gave permission for the magazine to use your quilt in it’s publication, but it would have been at least respectful for one or both organizations to have requested your permission to be in print… at the very least! Us quilters need to stand up for ourselves when it comes to being recognized for our hard work! And you definitely worked hard on that wonderful quilt! Congratulations! I’ve always loved Kim McLean’s patterns, but I haven’t been brave enough to try one yet. 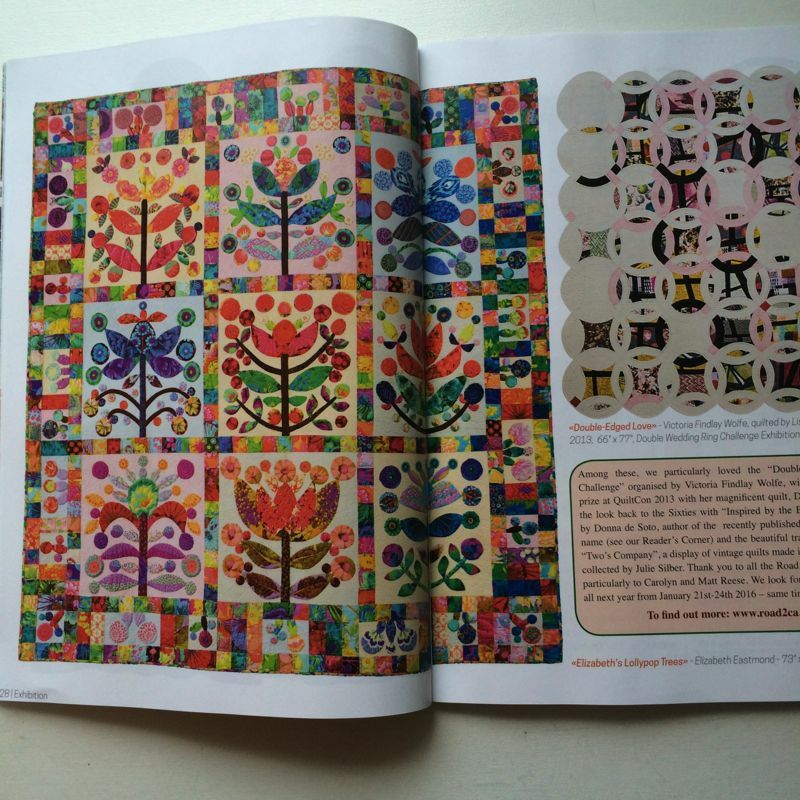 Yours looks fantastic, and what an honour to have it included in a prestigious magazine like QuiltMania. Well done. International attention–well deserved. I agree with Linda–in a way it’s lucky that you found out you were in this publication, and I feel they should have at the very least requested permission and sent you a free copy. That being said, it is such an honor to have your quilt appear in this publication. You do amazing work and it deserves to be seen by a large audience. What a wonderful surprise indeed Elizabeth!!! Your quilt is fabulous and well deserving of this attention! I am always astounded when I hear that quilters find out from other quilters (and not from the publications) that their work has been showcased.